In lieu of federal action, the declarations highlight a new local approach to confronting homelessness. While in a state of emergency, public officials in these five jurisdictions can suspend payments on certain government services in order to devote money to the declared emergency and pull additional staff in to address the problem. The declaration also allows public officials to act faster in connecting people with behavioral health services and placing them in shelters. As a side benefit, the declarations raise public awareness about homelessness. The most recent of these declarations came from Seattle Mayor Ed Murray and King County Executive Constantine. In terms of new money pledged to homelessness, it’s the least amount of the three cities -- just $5.3 million. * Of that amount, only $900,000 will go to adding 100 emergency shelter beds. 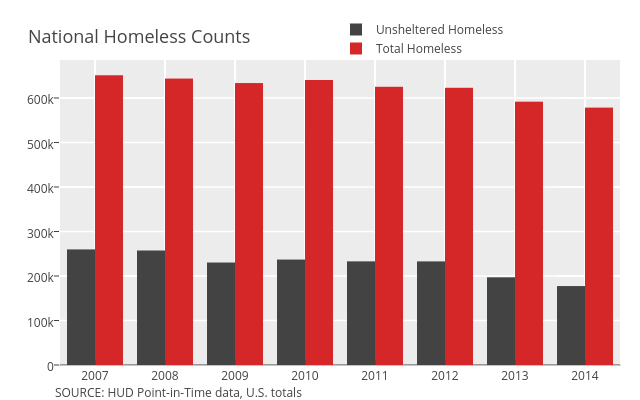 "It's extremely difficult to take that as a serious response," said Alison Eisinger, who directs the Coalition on Homelessness, a nonprofit advocacy group in Seattle. "There are 3,000 people on the street tonight." Seattle and King County's declarations did include a list of urgent requests from the state and federal government, including an expansion of rental vouchers. While Rankin acknowledged that the emergency declaration could add shelter beds, she was disappointed by how little city funding the Murray administration had committed to the initiative. "Acting faster with a very small amount of money is not necessarily going to result in a significant impact," she said. The $5 million "is going to be pulled in a lot of different directions." *CORRECTIONS: A previous version of the story incorrectly stated that Seattle had committed less new money than the other three communities in a homeless state of emergency. It has committed less than the other two cities, but more than Hawaii. The story also incorrectly stated the first name of Sara Rankin, director of the Homeless Rights Advocacy Project in Seattle.